For a cookie decorating kids cooking party kids get a chance to get a hands on experience, decorate the finished product and be able to eat what they created. Another option for the party is to make the dough ahead of time and just have the cooking party do the rolling out the dough and decorating. Once you know the number of children coming go through the list of things needed especially utensils, bowls, etc. If you need extra ask friends or family if you can borrow some items for your cookie decorating kids cooking party. A cookie decorating party is a get-together where kids come together to join in the fun and excitement of decorating sugar cookies! 1. Pick a Party Date  pick your date, set up your grocery list to make sure that you have all the ingredients in the house to make sugar cookies. Make sure you have sprinkles, frosting, and anything else that you might want to use to decorate your cookies with. Head to the store and purchase anything that you might need. Oh, and it is a bonus if you have extra paper towels on hand for any messes that might occur! 2. 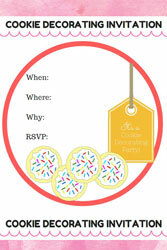 Invitations  If this is a party for your kids friends you might consider having them send/pass out some invitations. Invitations always make kids excited and filled with anticipation when they receive one. We have a few invitations to choose from. 3. Plan a Few Games- it will make your cookie decorating party a lot of fun if you have a couple of games planned out for the kids to partake in! Here are some kids cooking party games. 4. Make the Cookie Dough- sometime before the party  either the day of your cookie decorating party or a couple days before  make your cookie dough. 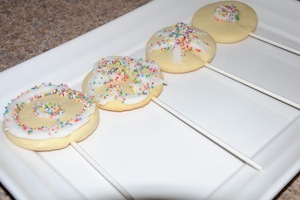 Ive included a freezable recipe for sugar cookie dough in my packet so maybe youll want to give that a try to minimize any stress on your part on the day of the party. Its a plus if you can have the cookie dough all made up before the children arrive because that saves on one step. 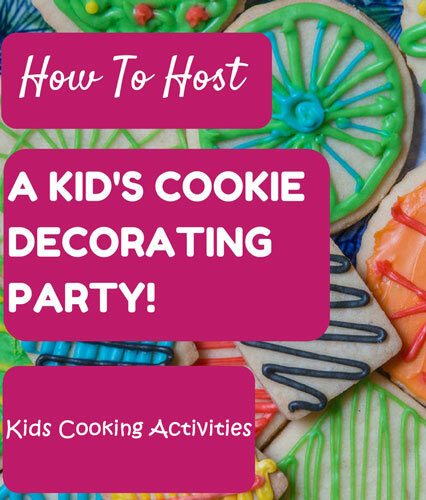 If you only want the kids to do the actual decorating and not the rolling and cutting out of the cookies, then you could also bake the cookies before the guests arrive and have them cooled and ready to be decorated. 5.Set out Decorationsyou can make separate bowls and fill them with all the different cookie decorations that the kids can use to spruce up the cookies. Youll want enough bowls to hold each individual decoration. ; This will make it easier for the kids to carry the bowls to their decorating station without too much of a hassle. We are going to follow the recipes from the following page- cookie recipes. You can choose one of the three cut out cookie recipes on this page- basic sugar cookie dough, simple sugar cookie recipe, or brown sugar and spice cut out cookies. Any of these recipes will make a great dough for the cookie decorating kids cooking party. When preparing the recipe allow kids to take turns adding and stirring ingredients in a large mixing bowl so everyone gets a turn. You should be able to use the dough without chilling it for several hours. When dough is complete give each child a portion of the dough and allow them to roll out the dough on a floured surface. Cut out cookies with cookie cutter and place on cookie sheet. Have an adult bake and allow cookies to cool. While you are waiting for cookies to cook and cool, prepare another recipe you have planned, decorate aprons, chef hats or play cooking games. Set table with frosting, table knives and sprinkles. Allow kids to decorate and place on a paper plate or shallow box to take home. 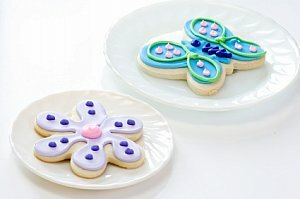 Learn more about decorating sugar cookies. The following is a list of 12 fun decorations to use at the cookie decorating party. And, if they inspire you Ive created little labels that you can cut out and set up around your bowls that contain your decorations. Youll find my labels in the party kit that Ive created! Sprinkles  variety of different colors, shapes, etc. 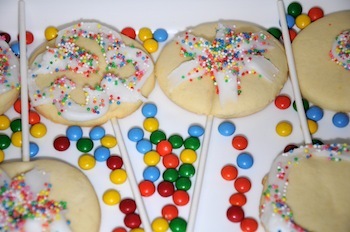 If you'd like to keep the cookie party simpler have the kids prep cookie pops and decorate when they have cooled. They are easy to make using the same cookie dough recipes suggested above, cut circles out of the rolled dough. Place on a cookie sheet leaving room for sucker sticks. Press a stick into each cookie and bake. 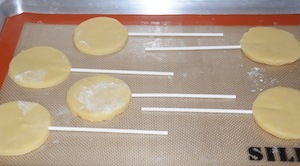 The cookie will rise over the stick and hold it in place. Allow to cool and decorate. You can place the kids decorated cookies in a sandwich baggie tied with ribbon to take home. 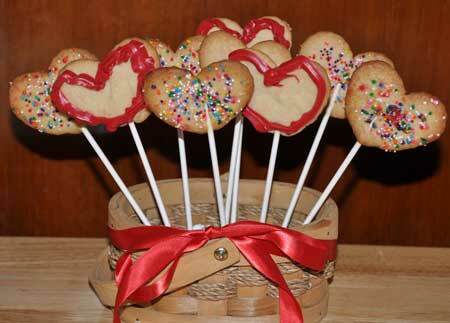 You can also make a cookie bouquet with your cookies. Back to Kids parties from cookie decorating kids cooking party.